After a long gaming hiatus from Andrea and me this was the first time we could get together again with the other Westpark gamers, so it was intuitively decided to make this a very relaxed round with shorter and easier games. We started with a gem(?) 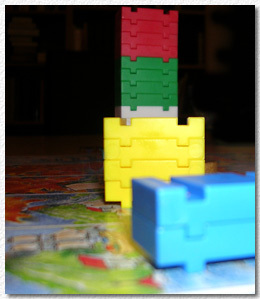 by reliable Wolfgang Kramer, Tabaijana, a game where some poor indigenous people have to flee a volcano island, but if they don't take enough pizza cartons with them (at least the game board suggests these are pizza cartons), they will starve at sea, In addition the pizza boxes (or crates) have to be stacked in the right order. Trouble is: they start as one big, chaotic stack. During the game each player is responsible for one colour. After a die roll he can move any stack he is involved in (or the ship, on which the crates have to end at some point). Splitting up the stacks is necessary to get the crates into some kind of order, a player can do this as long as he takes one of his own crates into the new stack, or leaves one of his own on top of the old stack. All crates plus the ship move on a single track path towards the inevitable end of the game. This is a collaborative game, from a time where working with statistical probabilities and working together were still relatively new concepts. Fact is that it becomes obvious after a few turns that each player can only do ONE best thing with his die roll, everything else is just plain stupid. As this is a cooperative game, all players will of course always discover the best move. Now it depends on the roll of the dice if you make it or not, as simple as that. This is very light entertainment from an author who later went on to create some of the best modern German games. Some games from this period of gaming have survived the test of time (like "Scotland Yard" or "Hare and Tortoise"), but this game is plain boring from a modern point of view. That the game material is minimalistic and unpractical to say the least doesn't help either. Don't open this pizza box of ye olden times - the pizza inside has long past its best before date! Peter is going to torture me forever for this present of mine...."Chez Geek!" is another one of the totally useless card games Steve Jackson has produced lately (with the exception of the excellent "Spooks"). The theme and the cards are funny because of the humour of the creator of "Dork Tower", John Kovalic, but the game play is dominated by the usually deadly combo of "solitaire game" with "take that!" cards. Each player represents a "slacker" who wants to acquire as many "slack" points as possible. Basically game play consists of you playing cards to acquire "slack" (depending entirely on what cards you happen to draw) and other players playing "take that" cards to prevent you from playing these cards. This continues until some player has enough luck and the other players have run out of "take that" cards. The only "strategy" consists of "going shopping" several times to drain your opponents of "take that" cards against you instead of shopping all items at once so they can all be prevented at once. Boy, were we glad we didn't play this totally useless game with Walter! One could cut out the pictures and create a nice comic with them, but playing the game is the only thing that will REALLY make you wish you were a slacker instead, as you might find hanging out in front of the TV more exciting than playing this game. Seriously! Now we were ready for a good game. Faidutti's and Moon's "Diamant" fit the bill of a game that can be explained in 3 minutes and played in 20. This has been reviewed elsewhere on this site, but let it be said that this really is a good and fun light filler game, the only problem being that there are a lot of light and fun filler games out there at the moment. But we had a good laugh, and the game has even some tactical issues that the advanced player can ponder about, so there really is nothing to complain about. This fine card game has been revived by some expansion sets and advanced rules. In its original form this was a kind of inverse Bohnanza. Players play ingredients and recipe cards on a pile, hoping that the cards below their recipe (after all card plays the tile is reversed) will be enough to fulfil the pizza recipe. Some recipes work, some don't, and one can never be sure as remembering the actual ingredients in the pile is very difficult. The expansion "Sole Mio" (also playable stand alone) adds some very odd recipes with partly complicated rules, and the possibility to "help" other players with finishing their recipe - for the price of finishing one of your own recipes for free. The odd recipes make the game more chaotic and unforeseeable, the "helping" options make the game more tactical. All in all this is a good and fun mix of ingredients, and the game was very well received in our group. After Peter explained it, we had the impression this was an complicated game, but once we got to actually play it, it turned out to be easy fare. Not to be played with hard thinkers, though, but on that evening we were all "in the mood".